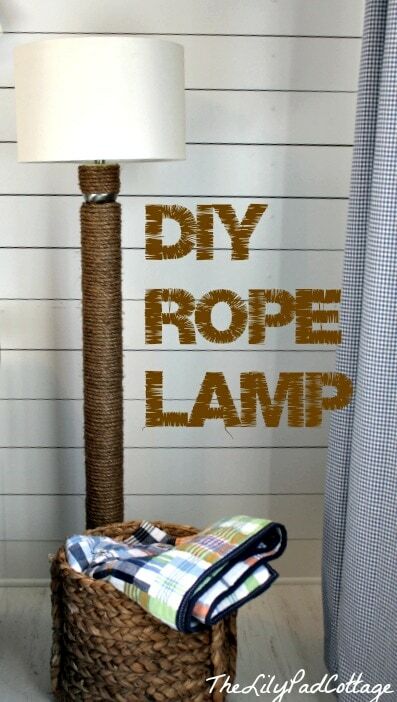 I have had a few of you asking me where I bought the lamp for little man’s room, so I figured I better share the tutorial for his DIY Rope Lamp ASAP! 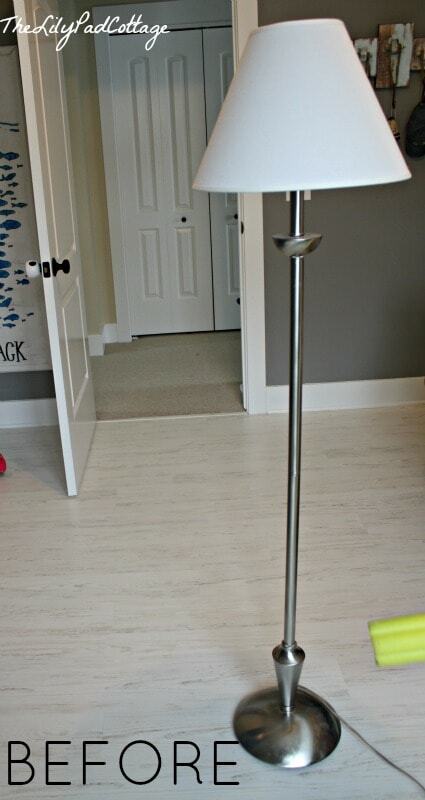 Well, this was what I was making – I started off with this skinny little lamp we have had forever. …but he calmed down when I let him help. He loves a good DIY, that kid! By the way, my kids do own clothing, I know almost every photo of little man features him in his jammies, but it WAS almost naptime :) After slicing the pool noodle and inserting it over the lamp, I wrapped the whole thing in masking tape to keep it on tight. 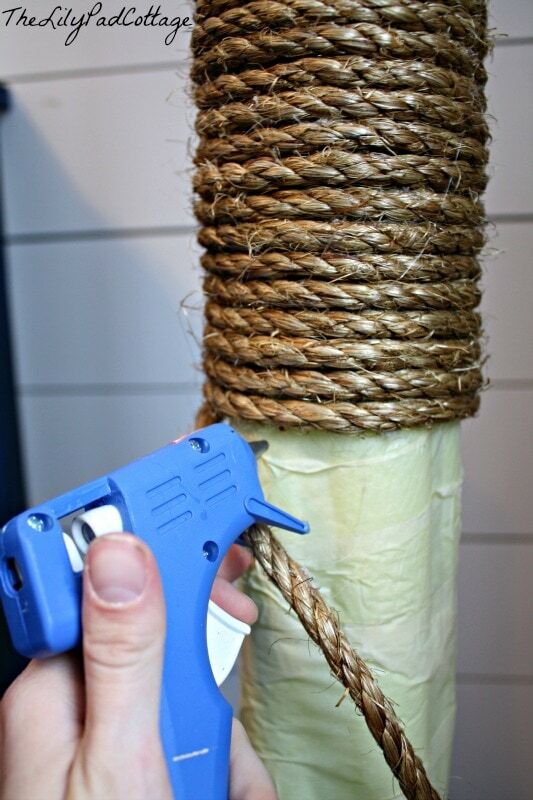 You can guess what comes next – just wrap, hot glue, repeat…keep wrapping…run out of rope…curse yourself for not buying two bags of rope…hit up Lowes…and wrap again. I got a bigger lamp shade from HomeGoods, because the old one looked a little small after I chunkified the lamp up and TADA! You can see the rest of little man’s new room here. Such a fan of stealing my kids’ things and turning them into housewares :) Love how this came out, it’s the perfect accent in the new room. I am SO impressed! That is such a transformation and so easy. I love when you can “shop” your own home. His whole room is adorable. Really creative all the way around. This is a genius idea …. I have a few lamps like that and I’m going to lowes soon. Thank you !!!!!! Oh good, Bev, good luck! Great idea and I love the little man wanting to help! He has his own little tool belt too, it’s so cute! What a neat idea! 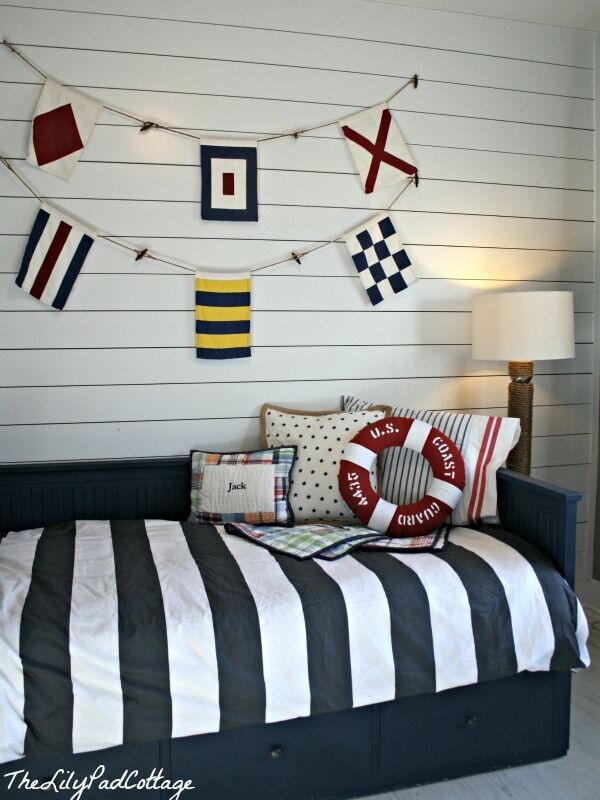 I love things nautical without being overly themey. You hit the mark. Hope you have a great day! Kelly, how much rope do your need ? Oh shoot, I don’t know the yardage, it just came in bags, and I needed 2 – sorry I’m no help! That is so funny. 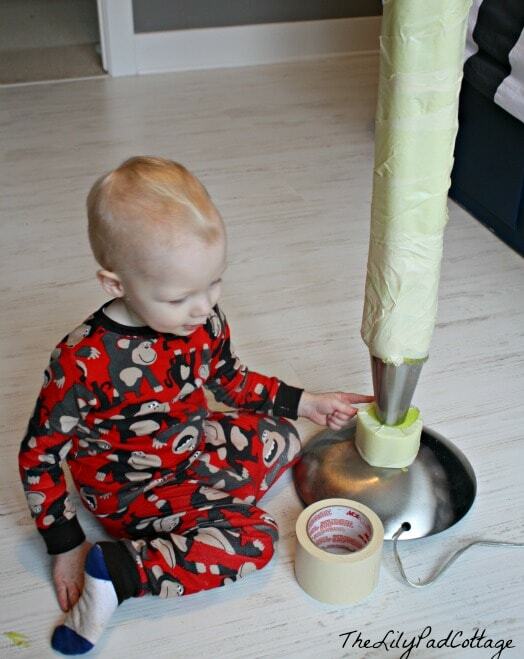 I did the same thing with my old lamp except I used a foam tube used to insulate pipes. I loved it but my daughter and her friends said it looked like a cat scratch post! Teenagers- what do they know! ha ha ha, well if we had a cat it would be multipurpose :) great minds think alike! LOVE! I pretty much love any project that involves rope! Looks perfect in his new room! I have a lamp that needs some help. Look out pool noodles, here I come! Go hit up the dollar store! This is so creative!!!! What a great upcycling project, it looks awesome in the room. Wow this is genius! I can never have too many rope projects, thanks for the idea! you are so welcome Katie! Thanks for stopping by! Wow that is amazing, what a fantastic way to recycle! Love the whole room by the way too!! Thanks Dria – it was so fun! Such a great idea and it turned out so well! I would not have thought to use the pool noodles! You are too clever!! 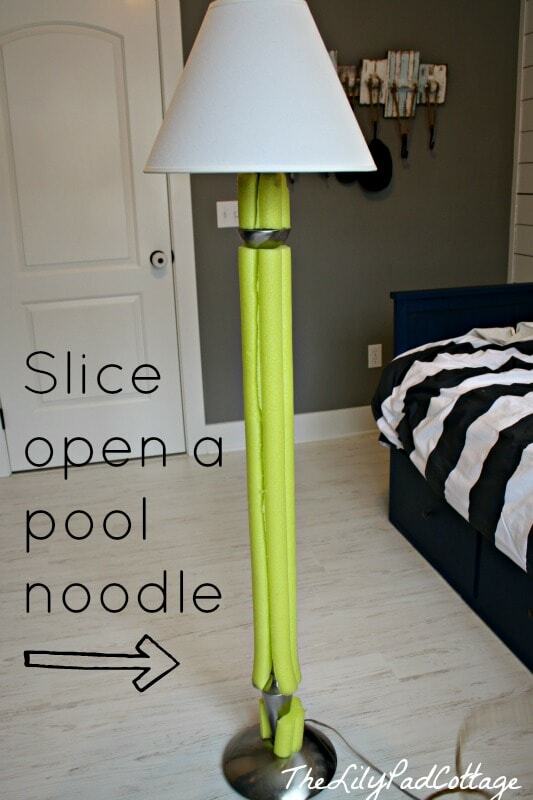 What a great look … and I love that you used a pool noodle! I like the addition of foam to bulk it up! Very cool. I like roping vases, so something like this would match my things perfectly! Thanks! 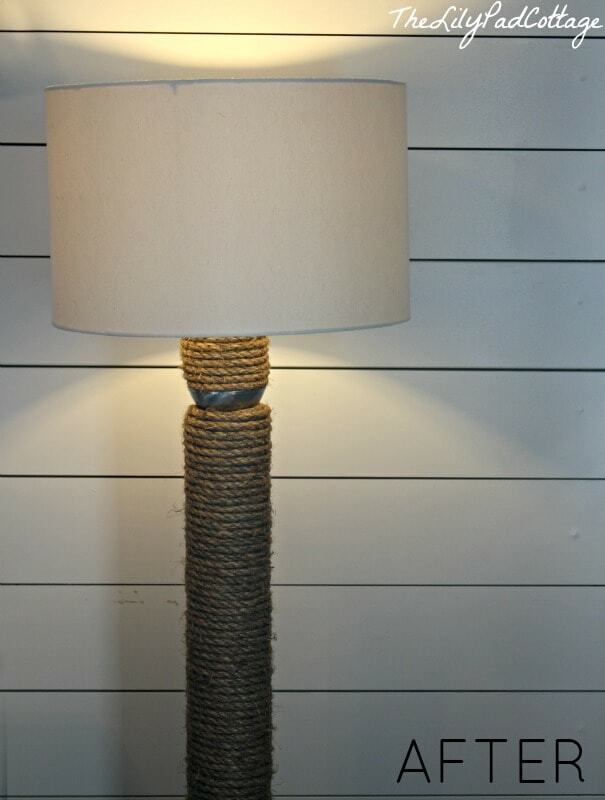 Oh love the idea of roping a vase! You are SO clever Kelly!!! Love this makeover!! WOW!! !